Colonial visor service cap for a cavalry officer. 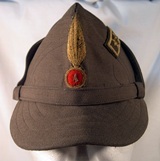 Colonial visor service cap, pattern 1942, for a cavalry officer. More precisely it is a Lieutenant Colonel of 4th Regiment of Genova Cavalleria. The regiment, originated from the "Blue Dragons", was created on January 26, 1682 by Duke Amadeus II and debuts at Carignano during the campaign of 1690-93, against the French. The saying of the Regiment, which took part during WW. 2 in the operations in North Africa, is: "Soit à pied soit à cheval mon honneur est sans ègal". Very rare and headgear in perfect condition. Notify me of updates to Colonial visor service cap for a cavalry officer.